Outside the legendary California Carnivores in Sebastopol, California. // WHAT'S THE WORLD'S FASTEST PREDATOR? A cheetah sprinting at 70 miles/hour (112 km/hour)? A peregrine falcon diving at 200 miles/hour (320 km/hour)? This one, specifically: of the genus Utricularia. Utricularia gibba shown here, an aquatic species. The tiny black dots along the grassy stems of the plant floating underwater are the feeder traps, the "bladder" in bladderwort. This particular gibba was submitted by an attendee (whose name I didn't catch from the show card) of the 2018 International Carnivorous Plant Society conference in Sonoma County and won first prize! Its name in Latin comes from the word describing the leather bladders or pouches used for storing wine and it's exactly this leather pouch that makes utrics the fastest eaters of prey. Above ground level, utrics are pretty but generally unassuming across the over 230+ known species today. Some flowers look like tiny rabbit ears (u.sandersonii) , others show up as constellations of yellow paint drops bursting from the grass (u.cornuta). But below ground, the utrics' tiny lima bean shaped bladders (hence their common name, the bladderworts): in the soil for terrestrial species or floating like so many specks of dirt in aquatic ones, are nature's suction traps that when triggered, vacuum in wandering prey in less than 1 millisecond. Once suctioned into the bladder traps, prey are dissolved and their nutrients absorbed into the plant. The trap then resets itself, like squeezing an eye dropper, waiting for the next food source to swim past it. Per the research of Ulrike Müller at Cal State Fresno, this is blisteringly fast--10X faster than the next known suction feeders like largemouth bass and other fish. My interest as a hobbyist is in growing and learning about utricularia. I'm a windowsill / sunny porch grower at best, but through conferences and scientific papers I've been devouring knowledge wherever I can find it (it just takes me longer than 1 millisecond). In August of 2018, the global ICPS conference took place in the United States, drawing attendees from six countries, representing multiple clubs and academic institutions from across the world. For three days, attendees gathered at the Hyatt Regency Sonoma in Santa Rosa for academic talks, showrooms full of plants, field excursions, or just catching up with new acquaintances over Thai food. Our educational home for three days. Nothing gets the conversation going like yummy thai food while you discuss the small business economics of running commercial greenhouses, introductions to the hobby and species fun facts. One of the things I was so privileged to hear and witness during the conference was everyone's tie to the famed California Carnivores greenhouse in nearby Sebastopol, California. Damon Collingsworth, today a co-owner of California Carnivores, shared his own story of voyaging to meet Peter D'Amato and acquiring his first plant, a cape sundew (drosera capensis). The other amazing thing I got to witness was ICPS presenting Peter with its inaugural Lifetime Achievement Award. An award with global cred is itself a huge honor, but even more inspiring were the queues of carnivorous plant society members, presidents, and sellers who lined up to pay tribute to Peter, all stemming from him personally, their dog-eared copies of Savage Garden, or a plant they had received through Peter personally or from California Carnivores. Damon Collingsworth (above, left) surprises Peter with the announcement before the conference audience. Peter D'Amato (bottom left) speaking to the audience upon accepting the inaugural ICPS Lifetime Achievement Award as California Carnivores staff member and conference organizer extraordinaire Daniela Ribbecke looks on. An international line of society presidents, shop owners and academics lined up to share how they all got their start thanks to his kindness, generosity and encouragement. My first California Carnivores acquisition! Utricularia alpina, joining my existing teeny modest back porch utricularia family. Many carnivorous plant enthusiasts can trace their origin stories to unwittingly killing their first venus flytrap. But no flytraps were harmed in the making of my enthusiasm for the hobby. My fascination started with an article in a National Geographic that I came across while hanging out at The Chattanooga Public Library while in elementary school. Large full color photos of carnivorous plants were themselves otherworldly and fascinating. But even more so were how carnivorous plants functioned. Carnivorous plants grew in environments that were low in nutrients and suffered from conditions often too harsh to support any other type of plant life. Low rain, high humidity, high temperatures, ravaging insects -- yet somehow carnivorous plants adapted themselves to not only survive in this harsh world, but voraciously thrive. My interaction with these special plants stayed mostly within National Geographic photo spreads or the occasional three hundred word essay for seventh grade science class until I was in college. Finding myself in the nature section of a Borders Bookstore while as a student in Baltimore, I discover-browsed this peculiar book: The Savage Garden by Peter D'Amato. My well worn 1998 copy of The Savage Garden by Peter D'Amato, whom every modern carnivorous plant enthusiast, from the windowsill hobbyist to the PhD field botanist, will cite as an influence and source of inspiration. It only took me twenty years to get my copy of Savage Garden autographed, but to do so in person at an international conference made it a worthwhile wait. For me and virtually every other enthusiast or commercial grower I've met, Savage Garden was the gateway drug into the hobby. After college, I took advantage of working second shift in a 24 hour factory, meaning my work day fell between the hours of 2:30pm - 12:30am, so I had a reserve of daylight hours to pursue other passions. I had the chance to volunteer for a brief time at the Atlanta Botanical Gardens, known for its own collection of carnivores. I'd help sweep up the greenhouse, pull weeds, and in the carnivorous plant bog, prune or "dead head" the Gardens's vast pitcher plant collection. Even if I was down in the dirt repotting plants, being able to take a break and wander the carnivorous plant bog was my payment. A hotel that I was happy to check into. First time as Bellhop / Concierge at any hotel for that matter. Inside the Plant Hotel, vacancy was getting pretty full. Almost to the point of needing to Airbnb out the remaining linoleum. Hanging out at the Plant Hotel volunteer area, where we helped store and protect newly acquired plants while their owners explore the rest of the conference. 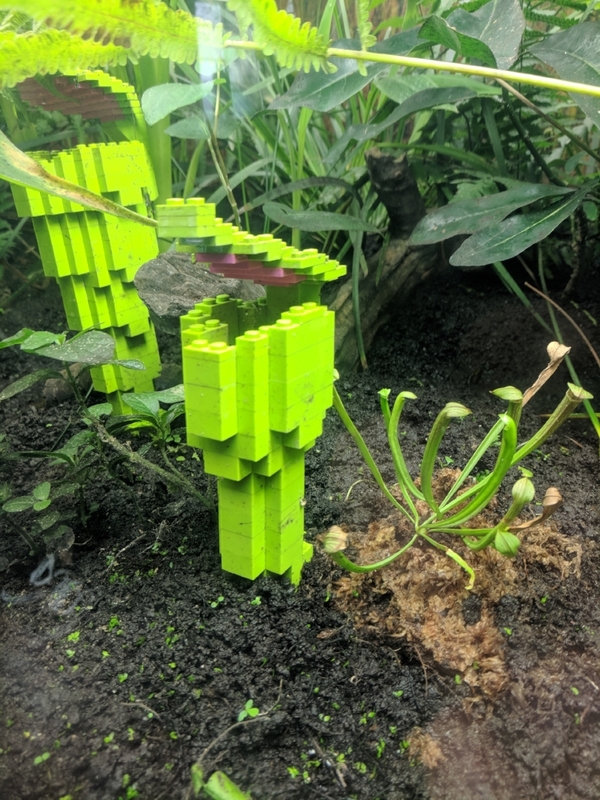 Carnivorous Plants and Art Museums: "The Atom vs. Dionaea"
Meet my familiar for plant cultivation, Victreebel. The only Pokemon I've ever caught or tried to catch. Interesting botanical hybrid to result in fangs on the peristome.